This article is focused on how Thymeleaf can be integrated with the Spring framework. This will let our MVC web application take advantage of Thymeleaf HTML5 template engine without losing any of the Spring features. The data layer uses Spring Data to interact with a mongoDB database. Insert a new guest: A synchronous request that shows how Thymeleaf is integrated with Spring’s form backing beans. List guests: An asynchronous request that shows how to handle fragment rendering with AJAX. This tutorial expects you to know the basics of Thymeleaf. If not, you should first read this article. This example is based on Thymeleaf 2.1 and Spring 4 versions. The source code can be found at my Github repository. This tutorial takes the JavaConfig approach to configure the required beans. This means xml configuration files are no longer necessary. Since we want to use JavaConfig, we need to specify AnnotationConfigWebApplicationContext as the class that will configure the Spring container. If we don’t specify it, it will use XmlWebApplicationContext by default. When defining where the configuration files are located, we can specify classes or packages. Here, I’m indicating my configuration class. My configuration is split in two classes: thymeleaf-spring integration (WebAppConfiguration class) and mongoDB configuration (MongoDBConfiguration class). @ComponentScan(“xpadro.thymeleaf”): Activates component scanning in the xpadro.thymeleaf package and subpackages. Classes annotated with @Component and related annotations will be registered as beans. We are registering three beans which are necessary to configure Thymeleaf and integrate it with the Spring framework. template resolver: Resolves template names and delegates them to a servlet context resource resolver. template engine: Integrates with Spring framework, establishing the Spring specific dialect as the default dialect. view resolver: Thymeleaf implementation of the Spring MVC view resolver interface in order to resolve Thymeleaf views. This class extends AbstracMongoConfiguration, which defines mongoFactory and mongoTemplate beans. The @EnableMongoRepositories will scan the specified package in order to find interfaces extending MongoRepository. Then, it will create a bean for each one. We will see this later, at the data access layer section. The controller is responsible for accessing the service layer, construct the view model from the result and return a view. With the configuration that we set in the previous section, now MVC Controllers will be able to return a view Id that will be resolved as a Thymeleaf view. A typical MVC Controller that returns a “home” view id. Thymeleaf template resolver will look for a template named “home.html” which is located in /WEB-INF/html/ folder, as indicated in the configuration. Additionally, a view attribute named “hotelData” will be exposed to the Thymeleaf view, containing hotel information that needs to be displayed on the initial view. Another nice feature is that Thymeleaf will be able to resolve Spring managed message properties, which have been configured through the MessageSource interface. Trying to add a new user will raise an exception if a user with the same id already exists. The exception will be handled and the home view will be rendered with an error message. The th:unless Thymeleaf attribute will only render the span element if an error message has been returned. The service layer accesses the data access layer and adds some business logic. 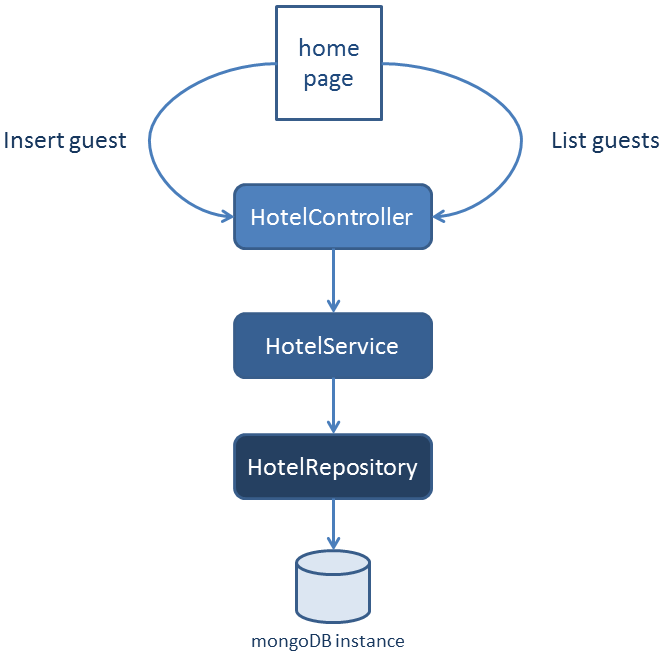 The HotelRepository extends the Spring Data class MongoRepository. Since this is the package where the repository is located, Spring will create a bean and inject a mongoTemplate to it. Extending this interface provides us with generic CRUD operations. If you need additional operations, you can add them with the @Query annotation (see code above). We have configured Thymeleaf to resolve views in a Spring managed web application. This allows the view to access to Spring Expression Language and message resolving. The next part of this tutorial is going to show how forms are linked to Spring form backing beans and how we can reload fragments by sending an AJAX request. Thanks Anil. I haven't used Spring Mobile so I can't help you with that. Anyway, in the URL you provided, there are some examples of defining the required beans using Java-based configuration. Hi, very helpful and clear example. Thanks. I am just Newbie and I am studing example from official Spring.io "Yummy noodle bar". There are data transfer using events and there are also simalar object for different layers(rest, core, persistance) and due to this is project quite large. Do you see any advantage fir this approach for smaller projects? Petr F.
Yes, indeed. Thymeleaf is perfectly suitable for small projects too. In fact, I am using it as the view layer in one of my projects. thanks. it work find for me. Hi and many thanks Lauren 🙂 You can check my new spring security repository as something I included recently. I hope to add more articles soon!